Bernalillo County is the most populous county in the state of New Mexico. Based on the 2010 census, the population was 662,564. Bernalillo County was one of seven partidos established during Mexican rule; in 1852, within two years of the creation of the New Mexico Territory, Bernalillo became one of that territory's nine original counties. In 1876, it absorbed Santa Ana County. The county seat is Albuquerque, which is the most populous city in New Mexico. While Coronado's exploration of "New Spain" occurred as early as 1540 in the Tiguex area near present day Bernalillo, the first colony was not settled until 1598. Bernalillo County was established 8 January 1852. It was one of the seven Partidos, established during Mexican rule. It may have been named for the Gonzales-Bernal family that lived in the area before 1692. The county seat is Albuquerque. 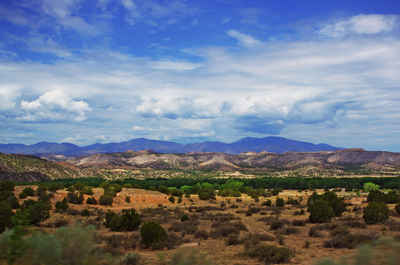 Bernalillo County has a high volume of commerce, farming, business, and real estate sales. Albuquerque has been thriving since 1706 and is the center of activity for fairs and conventions. The division of counties in New Mexico can be traced back to the time of Mexican rule. The first subdivison of the New Mexico Territory was made in 1837 when two "partidos" - districts - were created. In 1844, New Mexico was re-divided into three districts. Eventually these districts were further subdivided into areas that include similar boundaries of today's counties. One interesting note - the first Bernalillo County boundaries were much larger than today's. The New Mexico Constitution, written when the state entered the Union in 1912, vested the law-making power of the state in the legislature. Bernalillo County derives its authority from the State Constitution. Counties are subject to the will of the legislature, modified only by the state constitution, the courts, and the legislative process. Bernalillo County has a Commission/Manager form of government which delegates most of the day-to-day administrative matters to the County Manager. 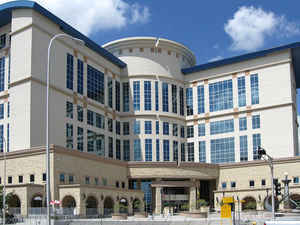 The County employs 1500 full and part time employees. Salaries of the Commissioners and the elected officials are set by the state legislature and vary according to county classification. Most employees are considered "classified" which means they are hired in accordance with personnel rules and regulations which govern eligibility, selection and termination. As reported by the Census Bureau, the county has a total area of 1,167 square miles (3,020 km2), of which 1,161 square miles (3,010 km2) is land and 6.4 square miles (17 km2) (0.5%) is water. 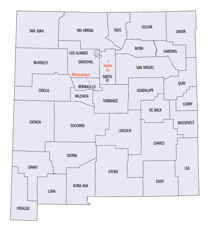 It is the third-smallest county in New Mexico by area.